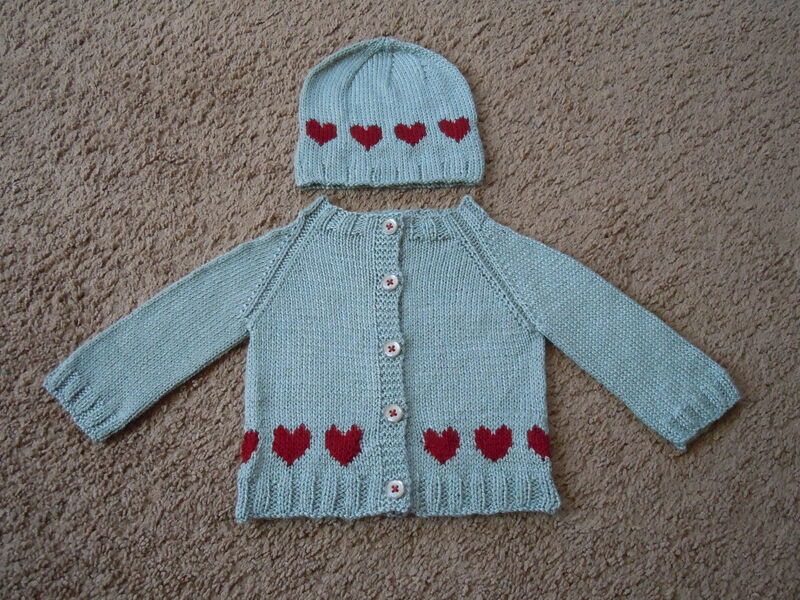 Heart Baby Cardigan – Complete! It’s done! It’s done! It’s done! I must say, I am so pleased with the outcome of this project. Isn’t it the cutest? Heart Baby Set as viewed from the back. I originally wanted to use some cute heart buttons I bought, but they weren’t the right color red to go with the hearts on the cardigan. 😦 I ended up using circular gray buttons and added a little color to them by using red thread. 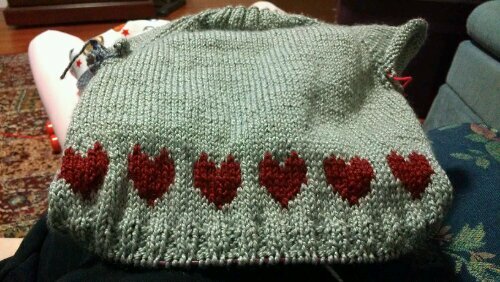 I think it looks fine the way it is, though, and I still have the red heart buttons to use on another baby item! I made a ton of modifications to allow for the inclusion of the heart chart. I didn’t bother to write them down, but there was some increasing and decreasing so that the chart and the ribbing at the bottom worked. I ended up with 11 hearts when all was said and done. I also used the sewn bind off for extra give in the hem and the sleeves. I hate tight edges, which is a shame, because I’m the master of making them. After washing and blocking, the chest measured 9.25 inches across, the sleeves measured 5.5 inches from armpit to the bottom of the cuff, and the entire sweater measured 10.25 inches from top to bottom. If you’re super interested in this sweater and want more details, they can be found on my Ravelry page. 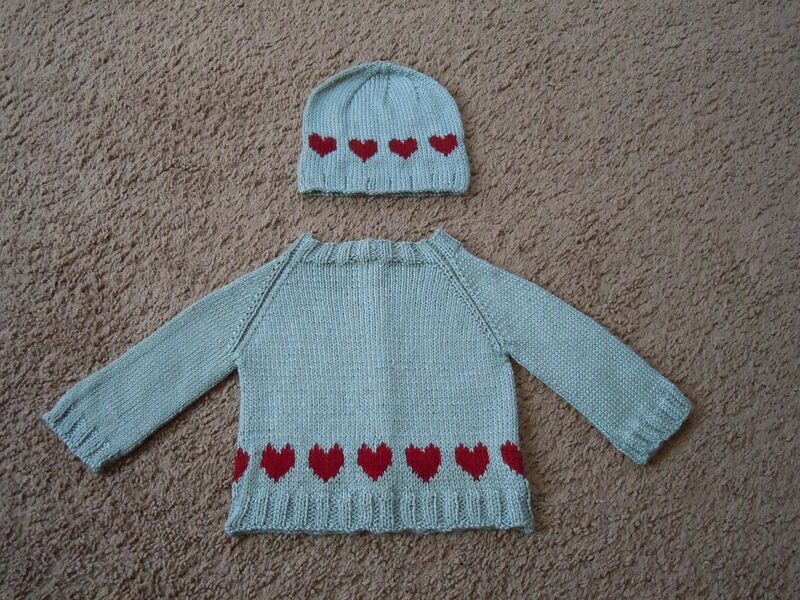 Categories: Knit | Tags: baby, bamboo, cardigan, colorwork, fairisle, gray, handmade, heart, knit, merino, red, silver, stranded, sweater | Permalink. I am ashamed. I had almost the whole day to knit (Eva went to her grandparents’ house), and all I managed to do was knit a sleeve. And it wasn’t even a whole sleeve at that! 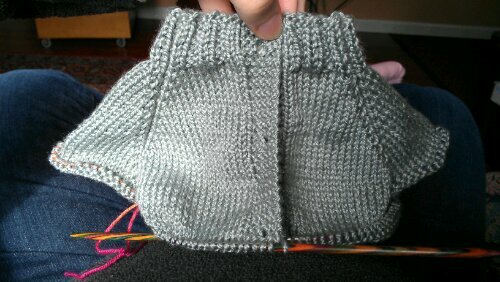 I’m still working on the ribbing. I’ll be using the same bind off on the sleeves (sewn bind off) that I used on the bottom of the sweater. And let me tell you, binding off the bottom took *forever*. At least it looks nice, and it’s stretchy. I hate tight bind offs. 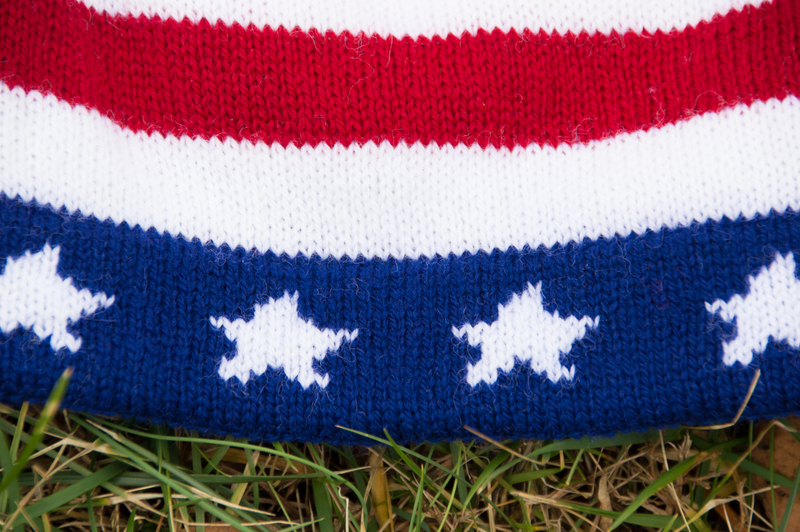 Obviously this sweater needs some serious blocking. It’s all…bunchy. I’m hoping it’ll fit our new addition next fall/winter. Though if she’s anything like her sister, it’ll still be too big by then! Categories: Knit | Tags: baby, bamboo, cardigan, colorwork, fairisle, gray, hearts, knit, merino, red, silver, stranded, sweater | Permalink. 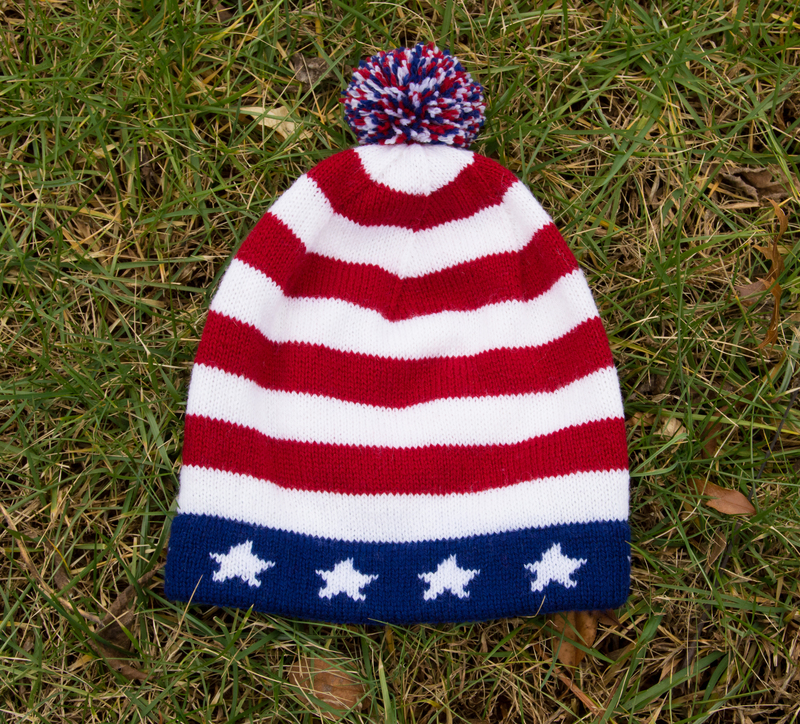 Much like the hat I completed earlier, my tension is still not up to par. The “end” hearts look a bit funky, so I’m going to try to do some strategic sewing on the wrong side to even them up a bit. Other than that, everything looks good. I’m finishing up the ribbing on the bottom of the body, and then I’ll be moving on to the sleeves. 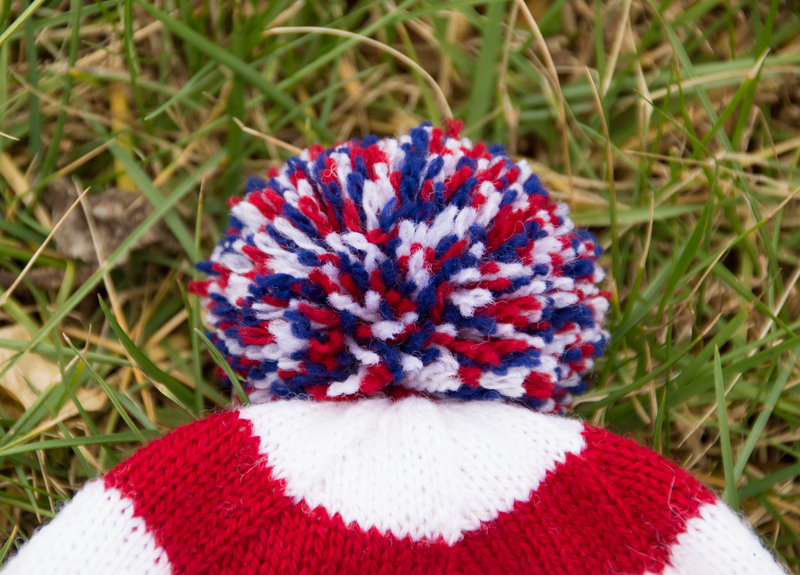 This is going to be such a cute ensemble! Categories: Knit | Tags: baby, bamboo, cardigan, fairisle, gray, handmade, knit, merino, red, silver, stranded, sweater | Permalink. Since I love the little heart chart I used for my Heart Baby Hat, I decided to make a matching cardigan with the same yarn and chart. 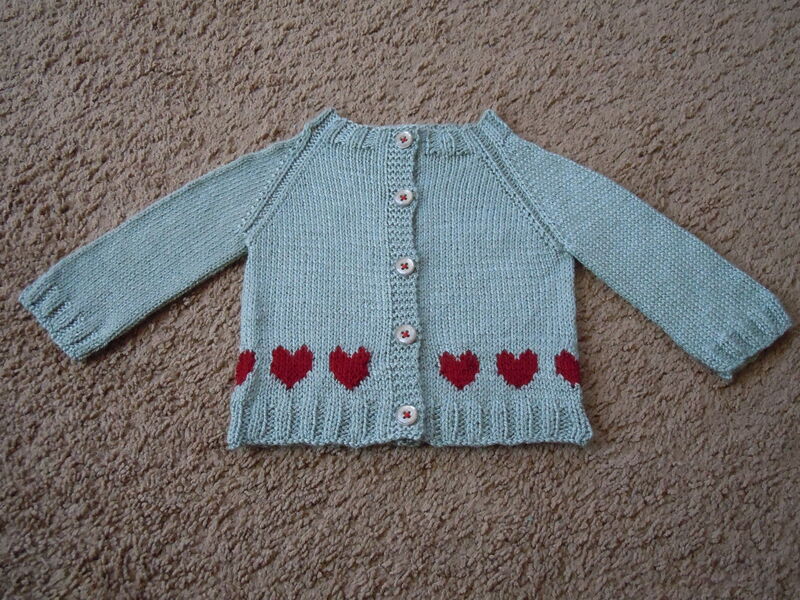 It’s just a basic raglan baby cardigan pattern with the heart chart added at the bottom. 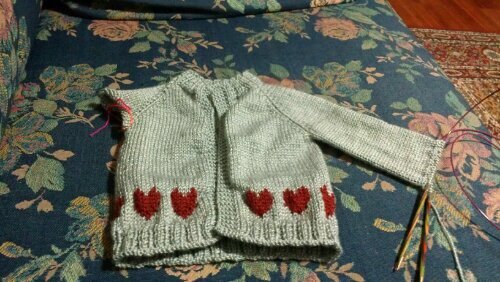 Heart Baby Cardigan sitting on top of its future recipient! I’m thinking this is going to end up being really cute, and I can’t wait to see it finished! Categories: Knit | Tags: baby, bamboo, cardigan, colorwork, fairisle, gray, handmade, heart, knit, merino, newborn, raglan, red, silver, stranded, sweater | Permalink.